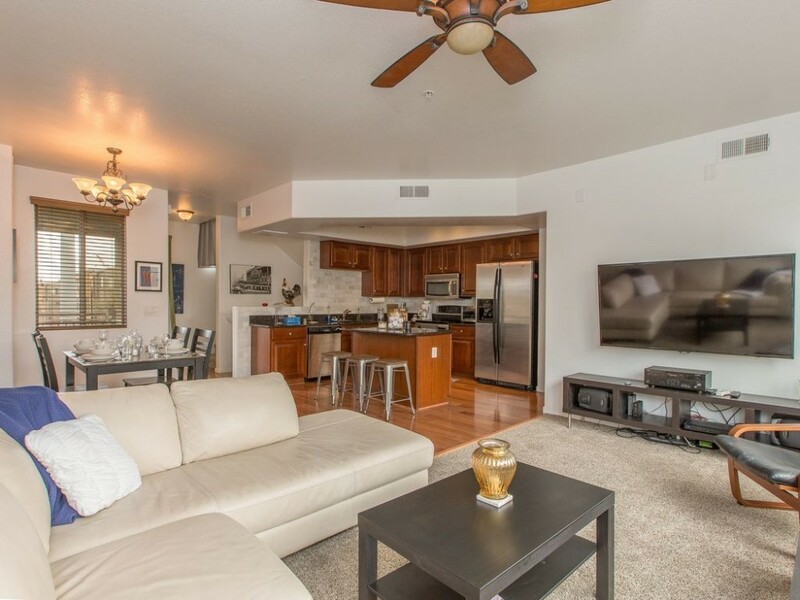 Our 2 bedroom 2.5 bath town home, in beautiful gated community can easily accommodate 4-6 guests comfortably, located across the street from the cubs stadium, Tempe market place and Mesa River view shopping and dining places. With easy access to the 101 & the 202 leading to all of the Scottsdale/ Phoenix metropolitan. Each bedroom features a Queen bed with HD television in each room and their own bathroom. Family room with television and fully stocked kitchen. With balcony. Access to the 2 community Pools and a 2 car garage. Villagio at Tempe is perfectly situated on Rio Salado and Evergreen, just east of Loop 101 and close enough to feel the pulse of ASU college life; these gorgeous town homes and manor homes are sure to impress. Villagio is a cozy gated community with a warm and friendly atmosphere boasting spacious landscape areas and two pools. Ideally located close to Loop 101 and Loop 202, easy access to work and play is just minutes away. Local attractions include Karsten Golf Course, Tempe Town Lake, Downtown Tempe shopping, ASU, Desert Botanical Gardens, and the Phoenix Zoo. A short drive north will lead you into bustling Scottsdale, where you can experience world-class cuisine, arts, shopping and a vibrant nightlife.